Our 100 days is next Tuesday. I was just going to stick 100 Dora stickers on my preschooler’s shirt, but this is so much cooler – and nearly as simple. Thanks for the tip. Our school has the kids each bring 100 pieces of a favorite snack to share. Fun, but it’s hard to imagine that every one of those families will have washed hands/tables before counting their snacks out. Trying not to think about that too much as we count 100 raisins this weekend. So cute!! What a great idea! We’re not in school yet. Our 100th day of school is coming up! We just got the flyer in the mail…was thinking of making 100 hair barrettes for her Rapunzel doll :). 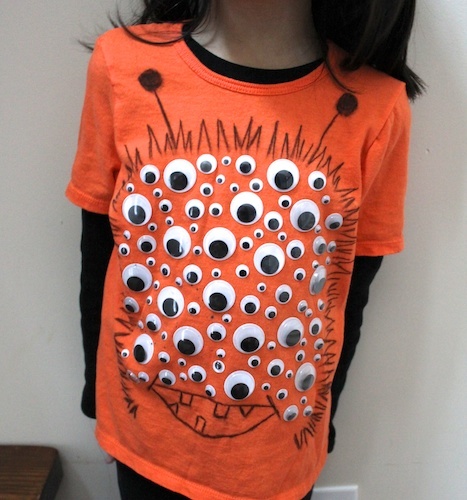 Love your monster eye ball shirt! That is too cute! You are so creative! How fun is that?! Such a sweet t-shirt – I love it! AWESOME!!! so cute! I really want to make something like this too..but how do you do about washing it? i haven’t washed this shirt. it was pretty much a one time wear shirt. i could peel off the eyes if i wanted to, wash the shirt, then put the eyes back on. but wouldn’t be able to do that too many times. Love this!!! I will use this idea next year for my kindergartner. My 1st grader’s 100th day is in 2 days and we wrote 100 sight words with a sharpie on white foam, cut them all out, and hot glued them all over a black shirt. One of my students made a “100 eyes on me” poster with his pic down at the bottom of the poster for his 100th day project. This shirt is cute too. Did the eyes stay on ok, during the day? Was the adhesive on the eyes strong enough? Adorable idea! yes, she made it home with all 100 eyes still on her shirt. the adhesive was strong enough. i was pleasantly surprised. Each child & staff member in our school is collecting 100 pennies. Each class is doing different activities on the 100th day with the pennies. After all of the activities and celebrations are over we will be sending the pennies to the Leukemia and Lymphoma Foundation. We are hoping this will show the children, everyone can help in the cure for cancer. I have my students dress up like they are 100 years old, bring a collection of 100 items in sandwich baggie to display, we make necklaces with 100 fruit loops and have a breakfast! Each student gets a sausage link (for the 1) and two dollar sized pancakes (for the 00 in 100). Love kinder!!! This is soooo cute and seems so fun to wear!!! I want one! Ha! Thanks for the great idea!!! I have twin boys and this is going to be perfect! i’m definitely saving this creative idea for my future kiddies. SO cute. i’m absolutely in love with monsters. Love this! My son just came home and said ,”I need a shirt for the 100 day of school” soooo perfect..starting to work on it now! I like and will be copying your ideal. Absolutely adorable! 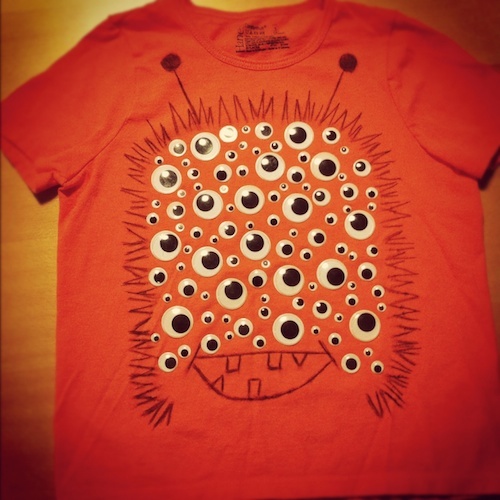 A couple questions: how did you stick the eyes onto the shirt? Would this be washable, or not? It is not washable unfortunately. I purchased the googly eyes with an adhesive back on them. Last year my Son’s Class dressed up as 100 year old people, this year nothing!